I'm feeling pretty good and although I didn't list my weight yesterday I DID weigh myself and I was down a pound. It's just crazy how this whole losing weight process works. I didn't end up leaving yesterday b/c we need a new tire on the car so I'll be hitting the road tomorrow. If you ever look at an weight loss surgery message boards, postops are just coo-coo for greek yogurt. Its almost cultish. Since I'm past liquids, soft food, and all that other bs, I didn't really think too much about it b/c I'd rather get my protein from a seared hunk of dead flesh. Still I decided to go look for it at my favorite ethnic grocer over in Arlington. I'm pretty sure that I could buy it at wally world or some other big box store but I'd pay out of the nose for a few small cartons of some non-authentic, gelatinized, white crap. Anyway, I found it AND it was dirt cheap. 2.99 for a 2lb carton. I used it as a dip for the gyro meat that I had for breakfast, and let me tell you that this yogurt is so much better than its wimpy, milquetoast, American cousin. 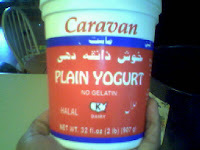 I'd never think of using bland ole American yogurt as a stand alone dip, but this is really good. I might use some of this and try to whip me up a smoothie or something. Anway, I gotta get up and clean up the kitchen so that the Mr. won't wonder what the hell is it that I do AAAAAALLLLLL day.